Well, the last few months have been incredible. In the last 4 months we have accomplished so much with our bands, and I think I’ll tell you exactly what. Over the summer, all our artists played their hearts out to audiences up and down the country, and in some cases, further afield. Thanks to Propeller Management, a mass of Sheffield artists headed to Wales to play Kaya Festival to artsy folk from all over the world. Deadset Dream also released their summer single ‘Snakes & Ladders‘! Fizzy Blood then went on to Hamburg to play the famous Reeperbahn Festival to a crowd of rock loving Germans, and are looking forward to another tour of Europe in November with JPNSGRLS, spreading across France, Germany, Holland and more. 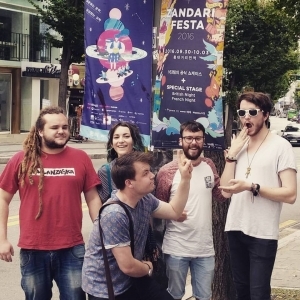 I Set The Sea On Fire had the time of their lives in South Korea in October, as they jetted out to Seoul to play the Zandari Festa Showcase to perhaps the most international crowd of music lovers on Earth. As well as sampling the ‘culture’ of South Korea, they also played two packed out venues and took part in the explosive festival finale. Alya Records added two new bands to their roster this summer, allow me to introduce RIVAL BONES and Smiling Ivy! A Grunge band and a Ska band is a welcome addition to our ever growing family of artists. We will be working on some major releases with both RIVAL BONES and Smiling Ivy in the new year! The Homesteads also released their long awaited self titled EP in late October! Lucie Barat (sister of Carl Barat of The Libertines) and her band The Au Revoirs will also be releasing their astounding new single ‘Speak Of Love’ through Alya Records on the 25th of November, and will be playing a sold out show for Camden Rocks Festival on the release date! And finally, we said Bon Voyage to long time Sheffield music scene heavyweights Stop Drop Robot and O Captain, releasing a compilation album of Stop Drop Robot fan favourites, and throwing 2 brand new tracks in there as well. With all endings comes a new beginning, and with that cheesy statement I will conclude this news post. Have a great day.